New Mexico’s Sangre de Cristo mountains are a place where two cultures — Hispanic and Anglo — meet. They’re also the place where three men meet: William deBuys, a young writer; Alex Harris, a young photographer; and Jacobo Romero, an old farmer. When Harris and deBuys move to New Mexico in the 1970s, Romero is the neighbor who befriends them and becomes their teacher. With the tools of simple labor — shovel and axe, irony and humor — he shows them how to survive, even flourish, in their isolated village. 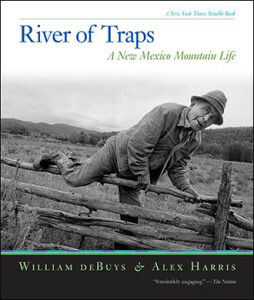 A remarkable look at modern life in the mountains, RIVER OF TRAPS also magically evokes the now-vanished world in which Romero tended flocks on frontier ranges and absorbed the values of a society untouched by cash or Anglo America. His memories and wisdom, shared without sentimentality, permeate this absorbing story of three men and the place that forever shaped their lives.